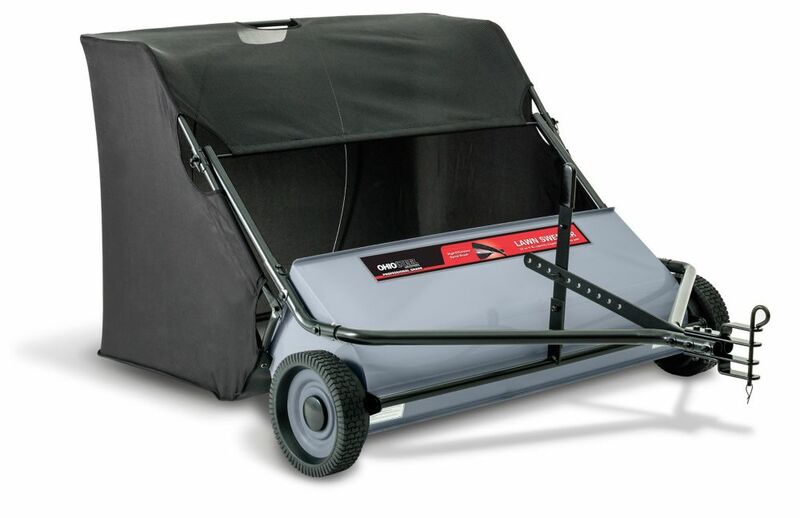 This professional grade Ohio Steel Lawn Sweeper features an extra-large capacity 22 cu. ft. heavy-duty collector bag and a 42 inch sweeping path allowing you to get your lawn care finished quickly. The exclusive patented spiral brush sweeps more efficiently than standard sweepers and puts less stress on gears for longer life. "No-slip" positive lock height adjustment will not vibrate out of position and has easy-to-remember height settings. Hopper empties by pulling rope from the seat of your tractor - just reverse to debris or compost area, pull the rope and you're done! Extra-wide 9 inch chute is less likely to clog, especially when sweeping damp grass clippings that can clump together. 3-position hitch adjustment allows for efficient level operation with any tractor hitch height - without the use of easy to lose spacer rings! The sweeper stands upright and bag folds for compact storage. Since the 1800s, Brinly has been manufacturing high quality gardening implements. Our tillage equipment is original and practically maintenance free. For individuals who use a plows and disc harrows, Brinly has a long history of providing quality gardening implements. MTD belts are designed and tested to consistently meet original performance standards. Their high strength tensile cords and specially engineered materials combine to resist wear and provide superior durability. The only way to ensure the best performance of your power equipment is to use genuine parts, accessories and attachments. We design and engineer these quality parts to exacting standards to provide reliability, safety and top performance. 42-inch 22 cu. ft. Spiral Brush Lawn Sweeper This professional grade Ohio Steel Lawn Sweeper features an extra-large capacity 22 cu. ft. heavy-duty collector bag and a 42 inch sweeping path allowing you to get your lawn care finished quickly. The exclusive patented spiral brush sweeps more efficiently than standard sweepers and puts less stress on gears for longer life. "No-slip" positive lock height adjustment will not vibrate out of position and has easy-to-remember height settings. Hopper empties by pulling rope from the seat of your tractor - just reverse to debris or compost area, pull the rope and you're done! Extra-wide 9 inch chute is less likely to clog, especially when sweeping damp grass clippings that can clump together. 3-position hitch adjustment allows for efficient level operation with any tractor hitch height - without the use of easy to lose spacer rings! The sweeper stands upright and bag folds for compact storage.